A few days ago I found out that my roommate had never seen either of the Tron movies. This needed to be fixed as soon as possible, so I went to the Kraemer Family Library at UCCS to pick up both of the movies on DVD. Imagine my shock when they only have the movies on Blu-ray, a format that I could not play. Disappointed, I left the library to catch the bus home. On my way out I walked past an electronics recycling bin, and something caught my eye. 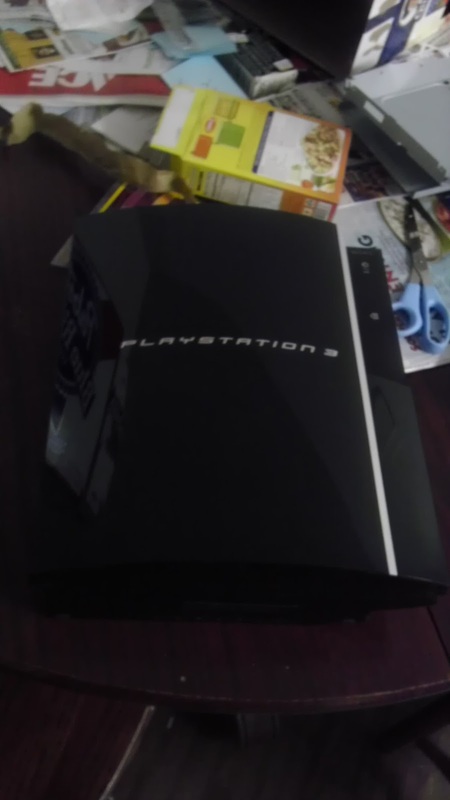 It looked almost exactly like a PS3, sticking out of a beer box. Of course, I picked it up and brought it home with me. 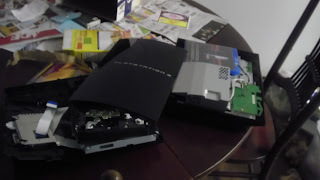 The PS3 parts. Please ignore the messy table. What I found inside the box turned out to be almost a PS3. It was in pieces, and missing a few important parts, including the Blu-ray drive, ironically. After some messing around, I managed to piece together the PS3, only to find out that it didn't work. It had the infamous yellow light of death (YLOD) that prevented it from turning on. This is caused by solder whiskers under the BGA sockets on the PS3, because of the lead-free solder used. Almost the exact same cause as the Xbox 360 red ring of death (RROD). There are several ways to fix the YLOD, most of them involving a heat gun or an oven. These are probably the best way to fix the problem. However, I did not have a heat gun or thermal paste with me. What I did have was my roommate's hairdryer, which gets pretty hot. I used the hairdryer on the hottest setting to heat up the underside of the disassembled PS3 for fifteen minutes. Then I let it cool for 20 minutes before reassembling and turning it on. The hairdryer trick worked. Heat from the hairdryer melted the tin whiskers and allowed the PS3 to function normally. I still had several problems: no controller or blu-ray drive. I pulled out every USB device I had: keyboard, Xbox 360 controller, PC gamepad, and a mouse. This controller works, thanks Sony! Sadly the Xbox 360 controller didn't work, but the PC gamepad did. The keyboard and mouse also work. 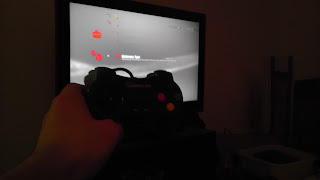 There is still no blu-ray drive, and the PC gamepad doesn't have analog sticks, but it's better than nothing. 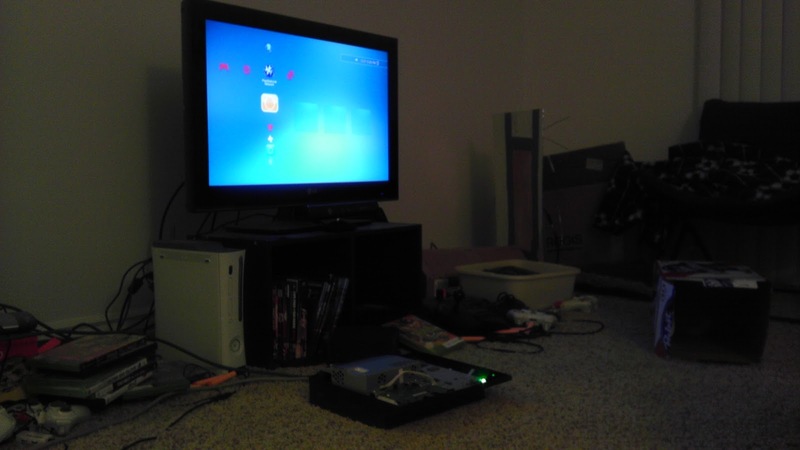 Another problem that I encountered was that nothing on the PS3 would launch. 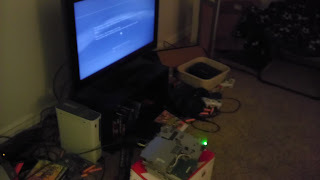 This turned out to be a disc drive error, and was fixed by plugging the drive control board into the PS3, even though there isn't a disc drive. The only question now is how long the hairdryer trick will hold up. I estimate about two weeks, but who really knows. 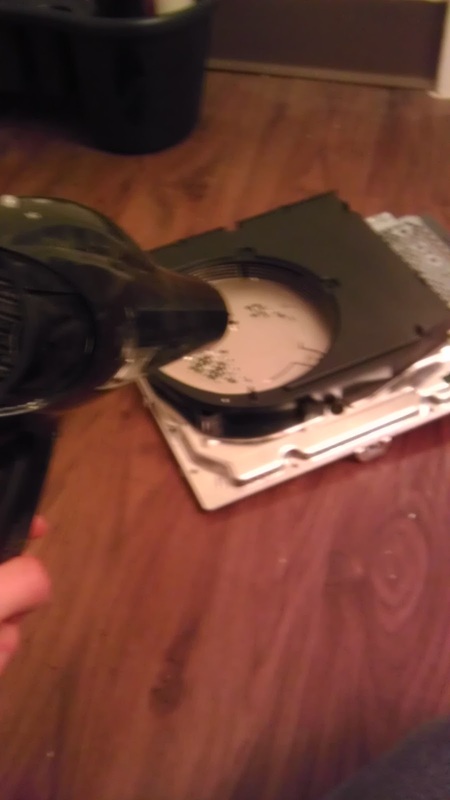 When that happens, I will probably get a heat gun and thermal paste to properly fix it. I'm also on the lookout for a matching Blu-ray drive. Luckily I have the working drive control board, so now all I need is a drive for the CECHG01 that doesn't cost as much as a new PS3. Note: This fix failed about two weeks later. You can see my more permanent solution in part two.